My great aunt gave me a bit of money for Christmas this year, as she does every year. It took me all of about two milliseconds for me to decide what to do with it. 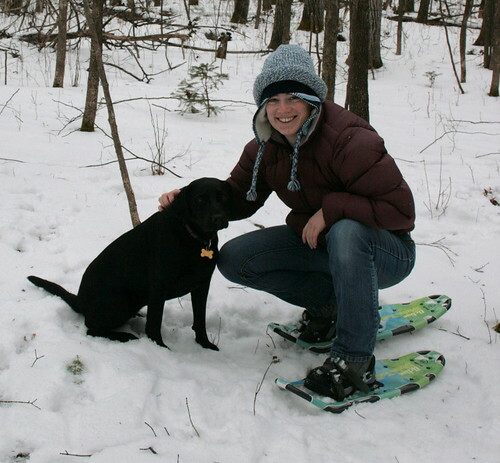 Last winter I’d been using the landlord’s traditional wood-and-catgut snowshoes, which she’d left behind for our use. From the time I discovered them in January through the end of the winter, I was out on them nearly every time I went hiking. By the end of the season, what waterproofing there had been on the laces (had there been any to begin with) seemed gone and the catgut would be soft by the time I returned. 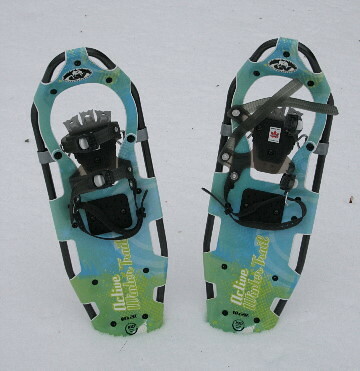 The leather bindings snapped on one mid-winter, and I had to switch them out for a pair of nylon bindings that were on the other, larger snowshoes (which Dan rarely used). These had a tendency to slip so my foot would end up on the shoe crooked, and I’d have to tie the straps to my bootlaces to make it stay straight. Knowing they were going to need some winterizing to prepare for this season, combined with how much use I got out of the snowshoes last winter, though, it was pretty easy to talk myself into getting a pair of new aluminum-framed snowshoes as a Christmas gift to myself (courtesy of my great aunt, who will be receiving photos in the mail soon). I picked them up on my way home from my parents’ place earlier this week, and took them for their first spin yesterday. They’re wooooonderful. So light I could barely feel them, so narrow I barely had to think about them, but with good flotation to keep me above the snow (not that we have a lot yet, but I made a point of stepping in the drifts…). The bindings held my foot securely and it didn’t slip sideways once. And, bonus, the company is Canadian, and their manufacturing facilities are next door in Québec. So as I was hiking around the edges of the property in areas I haven’t been to since the grass was green, I came across these interesting remains of a plant. 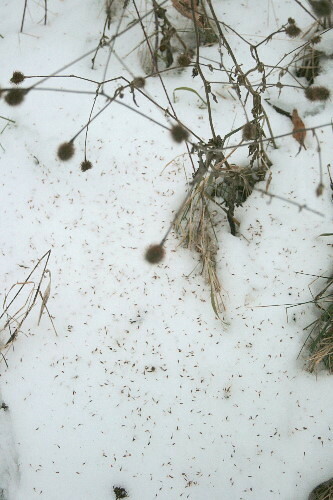 Small, round seed heads on long stalks, under which was a huge scattering of seeds. Curious, I thought. 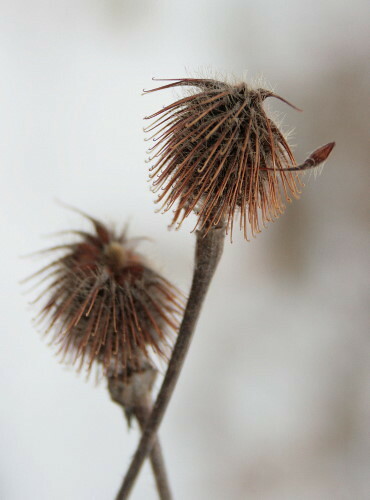 As I bent closer, I noticed that the seed heads were covered in small burr-like hooks. But they weren’t burrdocks, which are round and which come off as the whole spherical head, not as individual seeds like this was doing. Not to mention they’re very stocky plants, and this one was relatively delicate in comparison. I took a bunch of photos, as I always do when I come across a mystery, and came home to look it up. From Andy’s page, I identified the seed heads as belonging to a species of avens (Geum sp.). For Yellow Avens, Andy notes: “each flower head turns into a nearly spherical brown to dark brown bur about 2 cm in diameter; the seed in the bur has a sharply hooked tip which clings to fur, clothes and skin; burs present into winter”. That definitely sounds like my plant! I Googled “Yellow Avens” to see what information there was on them. One website I found noted that the native Yellow Avens looked very similar to the introduced Wood Avens, Geum urbanum. The ways that the author gave for telling the two species apart didn’t include seed heads, unfortunately, and I’m not sure there’s enough left on the plant of the leaves to be able to tell from those. The unremarkable five-petaled yellow flower would blend in with the other five-petaled yellow flowers in our fields, such as the common cinquefoils. I thought at first of a few flowers that had grown in our lawn last summer that I hadn’t been able to ID, but helpful reader Rosemary identified that one for me as just a different type of cinquefoil. So, I’ll have to keep an eye open for these next summer, now that I know where they’re growing. Perhaps I’ll be able to determine if it’s the native or non-native species of avens. We have lots of Avens — Avenses? — growing just the other side of the back fence. The book I used to identify them lists only native plants; guess I’ll have to re-examine them next year. I imagine songbirds must like the seeds? Hi, I think your site might be having browser compatibility issues. When I look at your blog site in Ie, it looks fine but when opening in Internet Explorer, it has some overlapping. I just wanted to give you a quick heads up! Other then that, excellent blog!